Below is a powerful article from Israel's sole liberal daily, Ha'aretz, on how repression of the Palestinians is also destroying democratic rights even for Israeli Jews. Not how Israeli Universities, Haifa in particular, have been complicit in the attack on Gaza. This is the true meaning of 'academic freedom' in Israel. Also posted and linked to is an excellent video on the Guardian's site. A new report from Adalah shows how the courts and police attempted to stamp out opposition to Operation Cast Lead. "This is a time of war, and every incident harms the people's morale." "Anyone who enables remarks denouncing the state and backing its enemies, even as they rain missiles upon its citizens, must obey its laws, and certainly is prohibited from attacking police who come to impose order. It is similar to a person spitting in the well from which he drinks." Here are some of the pearls in Adalah's new report: "Prohibited protest - how the law enforcement authorities limit the freedom of expression of opponents of the Gaza military attack." The document, being published for the first time here, was written by attorneys Abeer Baker and Rana Asali. They reviewed and analyzed hundreds of rulings and detention requests, interviewed dozens of human rights activists who were arrested and threatened during the Gaza attack, and documented the behavior of Israeli academia during the moments of truth last winter. The Adalah report was completed a few days before the Goldstone report was released. It harshly criticizes the damage to freedom of expression and the lack of tolerance for protests, primarily by Arab Israelis, against the attack on Gaza's civilian population. The report shows that enforcements officials did not learn from the October 2000 riots, and did not internalize the Or Commission recommendations. The authors wrote that while they worked on their report, President Shimon Peres accepted the recommendation by former justice minister Daniel Friedmann to pardon 59 citizens who committed criminal offenses during protests against the disengagement in August 2005. The president stated that the pardons were being granted out of an understanding for the young people's protests, and awareness that this was an unusual, historic event. The Arabs (and a handful of Jews) protesting against the bloody incidents that took hundreds of lives did not receive a fraction of that understanding. "In all court decisions we reviewed, the authorities did not mention the reason for the anger of war opponents," they stated. "The hundreds of dead, the injured, the destruction, the tragedy and the damage the Israeli army brought upon Gaza's residents are not mentioned anywhere in any remand decision. The detainees were presented as lawbreakers and criminals who should be treated harshly due to 'the situation,' unconnected from the political climate of their protest." The war mobilization went up to the Supreme Court. Of seven appeals submitted regarding the detainment of suspects until the completion of proceedings, the court sided with the state in every case. Supreme Court Judge Asher Gronis stated in ruling in favor of the detention of a minor until the end of the proceedings: "Of course, when times change, the matter of detentions will be reconsidered." He added, "When I say 'change in times,' this refers to the end of the military operation in the Gaza Strip and fewer violations in the Northern District." The researchers note that the "change in times" clause disconnects the detention from the circumstances of the suspect, and makes this a matter of a community's behavior. They note that the detention law was intended to provide uniform tools regarding the revocation of freedom and does not differentiate between war time and peace. The Adalah researchers found that detentions during fighting became a goal in and of themselves. The police and the State Prosecutor's office vehemently refused to consider releasing even minors from detention or restrictive conditions. The state's representatives in effect confirmed the detentions were designed "to send a deterrent message to the public as a whole and to the rioters in particular." During another remand extension hearing, they acknowledged this effort was aimed at 'deterring the protesters with force and detaining them until the end of the proceedings in order to convey a message to the public that such behavior is unforgiveable." These comments were made in a detention motion that the court found was not supported by any factual, evidentiary basis. Somewhat ironically, the police again defined the protests against the war as "a disruption of the peace." The prevailing trend around the world, including in Israel, is to try minors under proceedings that take into account their needs, welfare and well-being. Despite this, during the operation, hundreds of minors spent weeks behind bars awaiting trial. A review of several decisions regarding "daily detention" indicates how the police inflated the suspicions against the detainees, in order to lengthen their detention. For example, on December 29, 2008 the Hadera Magistrate's Court received a police motion to hold for another seven days two people suspected of rioting and interfering with a policeman carrying out his duties. The police representative argued that the suspects burned tires, threw stones at policemen and called for Jews to be killed. The court ordered them freed, stating, "The request to extend the detention is baseless and inflated, and it would have been better if some of the remarks in the motion had never been written." Under its obligation to uphold freedom of speech, specifically in times of conflict, the police used force to try to silence protest. 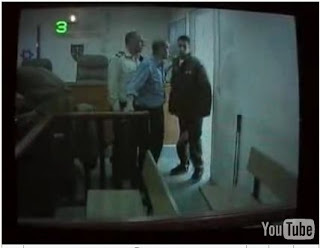 Adalah found numerous testimonies indicating a widespread phenomenon of people being arrested merely because they were present at an incident. Average individuals were accused of serious violations, spent a night in detention and were brought to court handcuffed. At many protest vigils, large numbers of police showed up and dispersed the gathering with force, under the pretense that the gathering was illegal. The testimonies clearly indicate that not all the protests required a police permit. In some cases, the police conditioned the release of protesters on their not taking part in more protests. Police used harsher threats to disperse legal anti-war protest vigils when there were also right-wing protesters there voicing support for the operation. In these cases, the police officials claimed that as few as three people is enough to justify crowd dispersal, declare the protest illegal and deem all the participants rioters. Protests were dispersed violently, and protesters sometimes suffered serious bruises. Buses en route to protests were commandeered and forced to turn around. The Shin Bet General Security Service also took part in silencing protest; the police summoned activists, but when they arrived at the police station, they were questioned by Shin Bet investigators. Some activists said their interrogators asked political questions and threatened to persecute them and make them responsible for every violation that occurred during the demonstrations. The attorney general supported the Shin Bet's questioning and threatening methods, saying that it was meant to calm the atmosphere. The report accuses intellectuals and academics of standing by during the violence in Gaza and overlooking the collective arrests of peace activists. Only a few lecturers mustered the courage to publicly protest the military operation. Academics who protested the collective arrest of settler teens did not speak out against the suspected IDF war crimes and the collective detainment of protesting minors. Academic institutions hung banners and took out newspaper ads voicing support for the war. 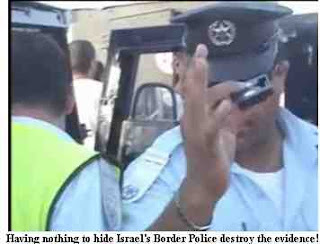 They stood by while the Shin Bet and the police charged at Jewish and Arab students protesting the operation. "As a show of solidarity with IDF soldiers fighting in Gaza and residents of the south, the University of Haifa has made its central tower into a national flag ... the university is not an ivory tower and is inseparably connected to the community. With this symbolic act, it expresses its great appreciation for the residents of the south and its support for the IDF's soldiers." "During Operation Cast Lead there were serious nationalistically motivated gatherings and rioting, occasionally accompanied by real disturbances including stone throwing and road blockades, and in some cases there was risk to human life and public welfare, similar to the events of October 2000 (albeit not on the same scale and not at the same intensity). "Alongside police efforts to enforce the law and restore order, the prosecution needed to increase steps to enforce the law and prevent the spread of the phenomenon. This was done via increased enforcement, insisting on detention until the conclusion of proceedings, based on the reasons for the detention (primarily endangerment) and carrying out the law to the fullest regarding criminals, subject to the specific circumstances of each case. "Court rulings, through the October 2000 events, called for detaining rioters - including minors - who were involved in nationalistically motivated disturbances that posed a threat to passersby and security forces, based on the specific danger posed by each detainee. The Supreme Court on more than one occasion determined that a person who throws stones at government agents seeking to restore order or at innocent bystanders may continue to endanger public safety and even human life. "That the actions stem from ideological fervor, and take place in large and heated gatherings, make them more dangerous. This is a phenomenon that builds on itself. Once it became part of the agenda of those rioters, the court ruled that the threat to human life cannot be ignored. "In cases involving the detention of minors, the prosecutors were instructed to ask courts to begin proceedings as soon as possible and to handle the cases quickly." The reaction of Israel's military spokespersons and government to the Goldstone Report, a report from a liberal Zionist and ex-South African judge speaks volumes. They are determined not to deal with the substance of the Report but to attack its author. I had a letter published in the Guardian yesterday pointing this and one or two other inconvenient facts out and it is republished below uncut. Like any criminal at the bar of justice, Israel's main complaint is that the Report is 'biased' and not good for the 'peace process'. A process which seems to not only absolve Israeli war crimes but give it advance immunity to commit more. Below are 2 reports from Ynet (the English on-line version of the Israeli daily, Yediot Aharanot). An in-depth look into the Goldstone Report probing the events of Operation Cast Lead in Gaza reveals the official first-hand testimonies from the days of the war. The testimonies were given by family members who lost their loved ones and eyewitnesses to the fighting, and they shed some personal light on what happened in Gaza. On the night of January 4, 2008, Iyad al-Samoni stayed with his wife, five children and 40 other members of his extended family in one a relative's house. Around 1am, sounds were heard coming from the roof, and some four hours later, Israeli soldiers came down the steps, knocked on the door and entered the house. The soldiers asked if there were Hamas operatives in the house. The family members said there weren't. Then the soldiers separated the men, from the women, children and elderly. The men were handcuffed, blindfolded and sent to a separate room, and were only allowed to leave to the toilet after one of them could no longer hold his bladder and urinated in the room. The soldiers settled in the house. The next morning, the family members left the house and started marching westward on Salah a-Din Street which leads to Gaza City. The soldiers ordered them to walk straight ahead on not stray from their path. The men were still handcuffed and the soldiers threatened gunshots if they tried to remove the shackles. While marching on Salah a-Din Street the, a single soldier or a number of soldiers station on the street's rooftops opened fire at the family. Iyad was hit in his legs and fell to the ground. His relative, Muhammad Assad al-Samoni tried to assist him, but one of the soldiers ordered him to continue marching. After noticing that the laser beam from the soldier's weapon was aimed at him, Muhammad decided not to insist. The soldier also fired warning shots at Muhammad's father, who tried to approach Iyad, and did not heed the family's calls to evacuate the injured Iyad. And so, the family was forced to abandon Iyad and keep marching towards Gaza City. Only three days later did rescue services get permission from the IDF to evacuate the body of al-Samoni, who was left handcuffed in the street and bled to death. The Juha family's home is located a few meters away from the al-Samoni family's home. The family's house was hit by a number of missiles on the nigh of January 4 and was seriously damaged. In the early morning hours soldiers entered the house and fired gunshots into the room where Muhammad was staying with his two wives, his mother and his 13 children. The family was taken to the upper part of the house and was then ordered by soldiers to march towards Rafah. The Juha family took off with the Sawafiri family, which lives next door. When the two families passed by the home of the Abu-Zoor family, they latter took them in. The three families spent the rest of the day together. The next morning, the house was attacked by the IDF. Soldiers ordered the three families to leave and separated the men from the women and children. Four men were taken to a nearby house and the rest were ordered to continue marching towards Rafah. At one point, while they were walking on al-Sakka Street, the families reached a large gap that blocked their path. The ruins around the gap prevented any passage and, and was a particularly difficult obstacle for the elderly. The family was therefore forces to turn eastwards to Salah al-Din Street, and stopped to rest at the Moughrabi family's home. After their experience at the Abu-Zur house, Juha decided it would be best to continue walking elsewhere. The Moughrabi family advised him to stay in their home, but the three families took off once again, with 15-year-old Ibrahim Sawafiri carrying a white flag. The moved along a short distance and then two gunshots were heard that hit Ibrahim in the chest. The three families ran back to the Moughrabi home, where they tried to give the youth medical treatment. Ibrahim's mother tried to stitch his wounds with a needle and threat that she tried to sterilize with cologne. Some six hours later, Ibrahim Sawafiri died of his wounds. 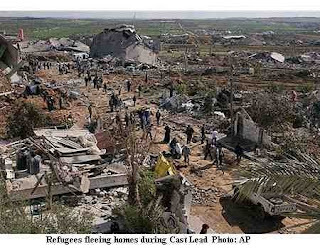 The three families remained at the Moughrabi home for three more days before aid organizations moved them to Gaza City. Johr a-Deek is a village located some 1.5 kilometers from the Israel border, southeast of Gaza City. On January 3, tanks entered the village, with some of them headed towards Salah a-Din Street and the Zeitun neighborhood, and some of the occupied the village. The next day, around 6am, shells hit the Hajjaj family's home – in which father Yousef, his wife and children, his brother's wife and her children, their sister Majeda, and the matriarch Ra'aia were staying. Yousef's daughter, 13-year-old Manar was injured in the strike. The Hajjaj family decided to move next door to Muhammad al-Safadi's home. Around 11am, Yousef phoned his brother and told him there were reports on the radio that the IDF was asking all residents who live along the border to evacuate their homes for their own safety. The Hajjaj and al-Safadi families left the house, which two of them carrying white flags. They marched westward and when they reached a distance of some 100 meters from Israeli tanks, which opened fire at them. Majeda and Ra'aia were injured. Majeda died shortly after, and Ra'aia tried to escape but collapsed a few meters later and died. The families fled back to the Hajjaj family home, and took an alternative road to Gaza City the next day. The family found the bodies of Majeda and Ra'aia under heaps of ash only when they returned to their house on January 18. On the night of January 12, the IDF struck houses in Huza'ah, a small Gaza village east of Khan Younis. Several white phosphorus shells hit the al-Najar family home in the village. The home, like many others in the area, caught fire. The residents spent the majority of the night trying to put out the flames. The night also saw IDF troops take to several rooftops, where they could observe the firefighting. 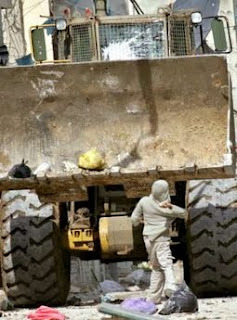 Around 3am, tanks and bulldozers began making their way to Huza'ah. At dawn, the IDF asked the men to leave their homes and march towards the tanks. Once they obeyed they were separated into two groups and placed under guard, in two houses. Around 7am, Ruhiya, a local resident who during the night placed makeshift white flags on the rooftop of her home, decided – along with several other women – to march to the village square. The women were carrying white flags and reportedly shouted at the soldiers that they had children with them. They walked to the home of Fariz al-Najar, who was taken by the soldiers. The soldiers apparently created a hole in the wall in order to allow surveillance of the nearby alley. When the women were about 200 yards from the house, a shot was fired, hitting Ruhiya. Her neighbor, Yasmin al-Najar, was also shot, in the leg. A gun fight ensued, forcing the women and children to find shelter in nearby houses, leaving them helpless to assist thier injured friend. The Khan Younis hospital was alerted to the situation in Huza'ah around 7:45am. An ambulance arrived at the alley within an hour and attempted to reach Ruhiya, but reportedly came under IDF fire and was forced to back away. Her body was eventually recovered the following evening. It is unclear whether she could have been saved had she been given medical attention. The State of Israel officially condemned on Tuesday the Goldstone Report which accuses the IDF of committing war crimes during Operation Cast Lead in Gaza, but the Israelis that testified before the special UN-appointed inquiry commission actually welcomed the harsh report, and urged the government not to ignore its conclusions. 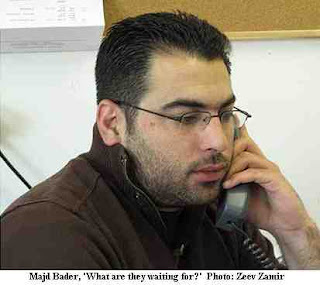 "Israel should wake up and take it upon itself to investigate the claims," said Attorney Majd Bader, who testified before the committee on behalf of the Public Committee Against Torture in Israel. "The State should study the Goldstone Report very well, consider it seriously, and understand the evidentiary groundwork that it laid and adopt its conclusions,"
According to Bader, human rights organizations had asked the government to set up an independent inquiring body shortly after the operation came to its end, but were ignored. "The Attorney General and those entrusted with enforcing the law in the State didn't even think of it. They just rejected the demand immediately. This resulted in other bodies taking care of the issue and now the conclusions are in. "In our opinion, it is better late than never. 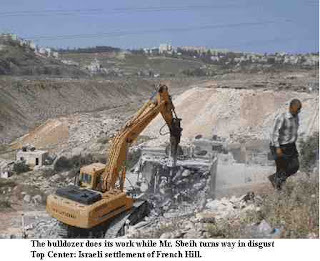 The State of Israel and the enforcement authorities should wake up and take upon themselves the moral and legal obligation to probe the claims. What are they waiting for?" Bader believes Israel's response was inappropriate. "Regarding (Israel's) grievances over the comparison to Hamas – in the same measure, any Palestinian will say 'What about the comparison between the occupier and the people it is occupying?' How can it be that the victim and the aggressor are judged according to the same standards? "The question is why are they calling the report insolent? Surely none of those who have responded have had the chance to read its 547 pages, so what is this based on? They are firing an automatic response that was prepared in advance. The recommendations should be studied. The committee, at least in its treatment of my testimony, examined in depth and heard my words in a very balanced way which was respectful to both parties. "I heard of how at the end of Noam Shalit's testimony, for example, the committee members told him they sympathized with him and understand his pain. To come and rule out in one stroke everything that the committee has done is not serious." Left-wing activist Yonatan Pollak, who also testified before the committee, said the harsh report united the various human rights organizations in Israel. "It's wrong to say that everyone is rejecting the conclusions of the report, the government can say what it wants, but all the human rights organizations are calling on Israel to launch an investigation into the incidents of the attack on Gaza and not refute the report's conclusions. "Such cooperation between human rights organizations has not been seen in a long time." 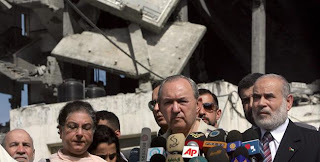 Pollak believes that, as in past cases, this time as well, the government will not bother to reach conclusions from the findings and open an official investigation, and therefore, the international community must respond sternly. "Israel's official response, as in its responses to prior reports, proves that there is no chance that Israel will probe the matter on its own," he said. He said the only solution to Israel's "indifference" is an external inquiring body with the proper jurisdiction for imposing penal sanctions. "The investigation must be carried out via international bodies that have the authority to probe and act against Israel. "It's time that the Israel and international societies start to treat Israel like a criminal state and a serial violator of international laws and Palestinian rights and impose on it a boycott, sanctions and the withdrawal of investments, just as was the case with the apartheid regime in South Africa,"
Pollak agreed with Bader's impression that the committee's work was thorough and balanced, and that Israel's claims of bias are unfounded. "It was my impression that this was a serious committee. I saw all the Israelis' testimonies and they were treated appropriately. On the other hand, the committee members heard the testimonies after visiting Gaza and seeing the catastrophe with their own eyes. The Israeli suffering cannot, and should not be expected to receive the same treatment as that of the Palestinians, because it simply doesn't come close,"
The clear message from Israel’s very own propaganda chief is that despite being authored by a liberal Zionist and former South African judge, Richard Goldstone, the Inquiry’s findings are motivated by anti-Semitism. There was a time when such accusations might have had some political purchase but those days have long since gone. The historic vote at the Trade Union Congress this week to support a boycott of Israeli goods tells its own story. No section of British society was as supportive of Zionism as that of British trade unionism which saw socialism being put into practice in Israel’s kibbutzim. Mark Regev speaks about bias and he is correct. Just as those who condemned the pogroms against Europe’s Jews were biased against anti-Semitism, so those who were opposed to the one-sided war against the Palestinians of Gaza were biased. Bias in favour of justice is surely no offence? Supporters of Israel seem to be in denial. For 6 months before the Gazan invasion they honed their media strategies and trained their internet warriors but no amount of hasbara can substitute for pictures of UN schools and ambulances being bombed with white phosphorous and dead children. A war crime is not diminished by a silver tongue. The reality is that the Israeli army has refused to countenance any criticism or inquiry. They first barred reporters from seeing what was happening in Gaza, then they banned the UN Inquiry from entering Gaza, then they derided the reports of their own soldiers as to what had happened and ignored criticism of the activities of the military rabbis. Now they have turned their fire upon the messenger. Those who learn nothing from the past are condemned to repeat its mistakes. If you want to understand Zionist civilisation and the ‘most moral army in the world’ in some depth then you can take a look at these pictures of child prisoners. The 12 year old boy here was freed early from his sentence and walking back to his village, waving a cigarette lighter, he was shot dead by the army. The other boy in the pictures is 16 and again shackled like some dangerous armed criminal (i.e. his captors). Please protest against the victimisation of a Palestinian minor, who courageously lodged a complaint against sexual harassment by one of the male guards in the Israeli Hasharon Prison. The minor from the occupied West Bank is now held in isolation, as part of the victimisation campaign she is being subjected to by the prison authorities - see details below in the email from Tirtza Tauber of WOFPP. Please protest to the Israeli authorities [see details below] and demand that the minor is immediately released from isolation. It is important that you emphasise that she would immediately be placed together with other Palestinian female prisoners unless she is immediately released from prison to be reunited with her family. Please circulate this call for action. Since the last month WOFPP has accompanied, with deep concern, the minor political prisoner who complained of sexual harassment by one of the guards in Hasharon Prison where she was held. WOFPP's lawyer, Taghreed Jahshan, visited the prisoner many times during the recent period and has sent a very urgent letter, on 6 September 2009, to the Prisons Service Commissioner, with copies to the Central Area's Commander and other persons of the Service Prison staff and to the Chairman of the Bar Association's Prisons Committee. Since there was no reply, another urgent letter was sent on 14 September, and again it had not been answered in writing. The letter raised serious claims of the prisoner - verified by affidavit – according to which, following the complaint she has submitted, the Prisons Service harassed the prisoner, by transferring her to another prison to the isolation/separation wing in which criminal prisoners are being held, without any legal basis, and holding her in inhuman conditions: a stuffy, very damp cell, without any sunlight, without TV, ventilator, books (except one book she brought with her) and without handicraft materials. The prison authorities also had taken from the prisoner her head coverings. In addition, there were many ants in the cell that disturbed her sleep at night. In fact, the prisoner sat about 24 hours a day facing the walls without anything to occupy herself with. All these details were reported in a letter to the Prisons Service Commissioner; however he did not see fit to reply in writing concerning these claims. Even worse, probably following the letter, insecticide was sprayed in the wing. 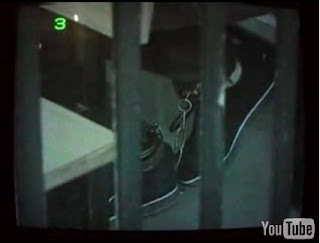 The prisoner was taken out of her cell for a few minutes and, immediately after the spraying, she was returned. As a result, she was overcome by feelings of suffocation and dizziness for some hours, and she continued to feel chest pain. Only on 15/9/09, after a month during which the prisoner was held in the conditions described above, she was transferred to a cell with reasonable conditions, but still in the same isolation/separation wing. These last days, staff members in charge at the prison where the prisoner is detained, made telephone contact with attorney Jahshan and told her that the most senior ranks handle the matter of the prisoner, aiming to find a solution for her by transferring her from the wing which she is held in. Our position is clear in this matter: a political prisoner should be in a political prisoners' wing - there is no other solution. The same staff members promised attorney Jahshan to update her on Monday 21 September 2009. If the decision that will be taken will not meet the required objective, a plea in the prisoner's name will immediately be submitted to the court. Regarding the prisoner's complaint against sexual harassment (attorney Jahshan represents her also in this matter): The prisoner says that she will continue to fight until the guard will get the punishment he deserves. It should be noted that WOFPP is in close and continuous contact with the prisoner's family which is updated on every detail. The minor prisoner has been held in isolation/separation for over a month and probably will have to spend the holiday of Eid-elFiter alone. And to the Israeli embassy in your country. As I have pointed out previously not only is the BNP totally devoted to Israel now, something which the Zionists have quickly picked upon e.g. 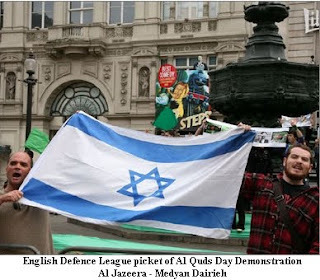 the Think Israel site but their racial brothers in the English Defence League, the patsies holding demonstrations in various parts of the country, decided to picket last Saturday’s Al Quds demonstration. 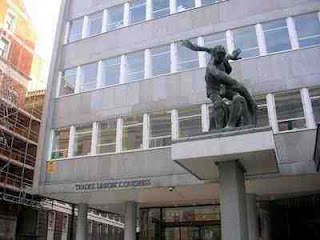 The TUC used to be a byword in support for the Israeli state. TUC leaders liked to point to Israel and the Kibbutzim as an example of ‘socialism’. That was before people became aware of the racist Jewish-only composition of these settlements, coupled with their establishment on land where formerly Palestinian villages stood or on stolen land. The watershed for Zionism was the 1982 invasion of the Lebanon, when some 30,000 people were killed, including the terrible massacre at the Beirut Palestinian camps of Sabra and Chatilla, when under the protection of the Israeli military, which provided lighting for the slaughterers, up to 2,000 Palestinian civilians in the camps were butchered by Lebanese fascists of the Phalange. Literally a marriage made in hell. But in 1982 the reaction amongst even Israelis was deep shame. 100,000 came onto the streets in a Peace Now demonstration against what had happened. Ariel Sharon was sacked as Defence Minister and the Kahane Commission, despite its weasel words, criticised him. Contrast with today. 1,400 Palestinians in Gaza were also slaughtered, not with knives but bullets and bombs. But as Israeli military eye-witnesses to the Goldstein’s UN Report have testified, Gaza was no more a war than Sabra and Chatilla. 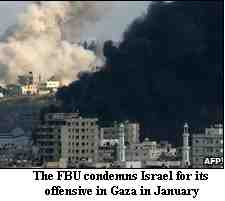 It was an unremitting attack on Gaza’s civilian population. Yet no Israelis, bar a handful of anti-Zionists and sympathisers came out to demonstrate. The week before the 100,000 demonstration, the Israeli left had mobilised 10,000 (equivalent to about 125,000 in Britain). Israel today has a fascist as Foreign Minister, a man who has boasted of his desire to personally drown thousands of Palestinian prisoners in the Dead Sea. Therein lies the change, and it is a sign of Israel’s self-deception when Mark Regev, its propaganda chief, can condemn the report of liberal Zionist Richard Goldstein as having been ‘conceived in sin and is the product of a union between propaganda and bias.’ The belief that if one attacks the credentials of the author of the Report, just as they attacked the reports of anonymous Israeli soldiers earlier this year, as they described what actually happened, then they will be change reality is a misconception that is not unique to Zionism. The vote at the TUC is not, as some might wish to believe, the product of quiet lobbying with TUC bureaucrats but the product of 4 years of campaigning for boycott among the grassroots in the trade unions. When the Fire Brigades Union submitted their motion calling for boycott and a review of links with Histadrut then even the most astute TUC bureaucrat was powerless to prevent a positive vote. For the past 3 years UNISON, with over a million votes, has passed pro-Palestinian policy, including support for a boycott and a review of Histadrut links. The T&GWU, one of the key components of the massive UNITE trade union already had pro-boycott policy. PCS had already come on board and this year the left RMT had changed its position to support boycott. No amount of pressure from the Foreign Office or lobbying in what used to be known as the smoke-filled rooms of Congress House could change these realities. Gaza was the awakening, the equivalent of Sharpeville in 1961 when protestors against the pass were mown down in cold blood by the South African Police. Yet in comparison the defenders of Apartheid were almost reluctant killers. Even in South Africa you didn’t have priests marching with the army giving them the courage that comes from moral righteousness. In South Africa right to the end Helen Suzmann was able to represent opposition to Apartheid from her Houghton constituency in Cape Town, yet there is no opposition to Zionism from Jewish representatives in the Knesset and its Arab members are subject to constant attack, villification and open calls for their murder. It is regrettable, to say the least, that the right-wing GMB union (which has traditionally belonged to the more stupid section of the right-wing of Labour politics with its regional barons) sought to prevent the FBU motion passing with a wrecking amendment. It is somewhat ironic that the GMB manages to combine support for a trade in arms with Israel and opposition to Boycott with affilation to British PSC. It even tried to substitute 'regret' for 'condemn' when referring to Histadrut's statement supporting the Gaza genocide. It is also clear from the speech of Brendan Barber, its General-Secretary and the statement of the General Council that nothing much has really changed. A commitment to 2 States, the ‘road map’ [surely they got that one wrong?!] and a belief that Histadrut can represent any movement for progress or change, shows that there is still work to be done and that fundamentally little has changed underneath. Given that the General Council statement is explicit that they will only support a Boycott ‘where trade union members should not put their own jobs at risk by refusing to deal with such products’ that there is a lot of work to do. The other points which should not be missed in the euphoria is that by a quirk of constitution, the General Council statement which was passed supercedes the resolution of the FBU. And the General Council resolution explicitly confines the Boycott to settlement goods as opposed to a Boycott of all Israeli Goods. The TUC reiterates our pledge to work in solidarity with the Palestinian General Federation of Trade Unions (PGFTU) and urges unions to support financially the TUC/PGFTU projects funded through TUC Aid as well as the joint Histadrut-PGFTU projects being developed in several sectors under the auspices of Global Union Federations. We welcome the resolution last year of the longstanding dispute over the remittance of membership subscriptions from the Histadrut to the PGFTU, which was brokered by the International Trade Union Confederation (ITUC), and support any stronger relations between the Histadrut and the PGFTU that they wish to develop. The key task ahead is to ensure that the call for a ‘review’ of links with Histadrut is translated into an active boycott of that organisation. Nothing could be worse than if a ‘review’ turned into a reaffirmation of links. And that we adopt the same position towards Israel as South Africa, namely that you cannot distinguish between one parcel of apartheid land and another. That also means that the focus of boycott should NOT just be on the occupied territories and settlements but on Israel itself. The Palestinians of the Galilee are just as much under occupation as those of Nablus. Below are reports from Scottish PSC and Israel Palestinian activist Omar Baghouti as well as the Resolution and amendments and notice of a Boycott Divestment and Sanctions weekend at the Wooler Youth Hostel. Delegates at the Trade Union Congress annual conference, representing millions of British workers, have resisted intense pressure from the British government and declared for a boycott of Israel because of its crimes. Hats off to the Fire Brigades Union (who submitted the motion) - they have saved the honour of the British trade union movement. 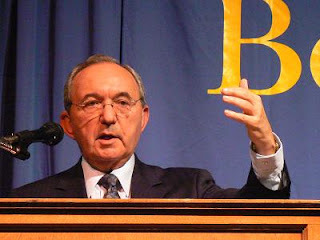 This decision follows Tuesday's report by the UN Fact-Finding Mission led by Justice Richard Goldstone which concluded there is evidence indicating serious violations of international human rights and humanitarian law were committed by Israel during the Gaza conflict, and that Israel committed actions amounting to war crimes, and possibly crimes against humanity. The prolonged situation of impunity has created a justice crisis in the Occupied Palestinian Territory that warrants action. One of the largest trade union federations in the world, the British Trades Union Congress (TUC), has overwhelmingly adopted BDS motions in its annual congress! The South African trade union federation, COSATU, and the Irish Congress of Trade Unions (ICTU) were the two national TU federations that preceded the TUC in adopting BDS. Given that TUC represents over 6.5 million British workers, this huge success is no small feat. The size and political significance of the British TUC's endorsement of BDS motions will surely add qualitatively to the impressive rise of the BDS movement after the Israeli massacre in Gaza, further confirming that our South Africa moment has arrived. The Palestine Solidarity Campaign (PSC) and its partners have worked tirelessly, persistently and tactfully for several years to reach this astounding victory, crowning previous BDS endorsements -- direct or indirect -- by the Scottish Trade Union Congress (STUC) earlier this year and several leading British trade unions including Unison and the University and College Union (UCU), the latter representing about 120,000 members in academia. A warm salute especially to the PSC, as well as the STUC, BRICUP and to all British BDS activists who contributed over the years to this watershed in the BDS movement's history in the UK, Europe and beyond. It is worth remembering that in the struggle against South African apartheid the British trade union movement was among the very few in the vanguard of boycotts and divestment that eventually spread to the rest of the world, helping the democracy and freedom movement in South Africa bring down the racist regime. Israeli apartheid and its apologists should take note of this. Below are excerpts from the motion that passed, sponsored by the amazingly principled and courageous Fire Brigades Union (FBU) and amended by the UCU. Following that is the PSC press release about this victory. Congress condemns the Government of Israel's January offensive in Gaza resulting in 1,450 Palestinians deaths and 5,000 injured and the massive destruction of infrastructure. Congress further condemns the ongoing blockade that is in contravention of International Law. ii) build solidarity with the Palestinian General Federation of Trade Unions. Congress condemns the Histadrut statement of 13 January 2009 in which it backed the attacks on Gaza and calls on the General Council to carry out a review of the TUC's relationship with Histadrut. d) support moves to suspend the EU-Israel Association Agreement. 4) encourage campaigns of disinvestment from companies associated with the occupation. In paragraph 4, line 1, replace 'condemns' with 'regrets'. In line 3 insert a full stop after 'Gaza' and delete the remaining words in the paragraph. In paragraph 5, delete sub-paragraph b). Renumber existing sub-paragraph c) as b) and insert at the start of it 'seek EU agreement to'. Renumber existing sub-paragraph d) as c). The last year has seen significant growth in the BDS movement. Trade union commitments, student occupations and initiatives by groups working for solidarity with Palestine have together transformed the landscape here in the UK and elsewhere. The Gaza massacres were the major factor in shifting opinion but, at enormous cost to Palestinians, this has greatly expanded support for the BDS campaign. Participants at the BDS weekend at Wooler will discuss ideas that can take this movement forward. Those new to BDS will have the opportunity to learn from those who have already been active in pushing out the BDS campaign in different fields. The weekend will provide a crucial opportunity to share experiences and reflect on the challenges and opportunities ahead of us. Please note the following timetable is subject to final amendment. The horrendous increase in overt racism in Israel, the targetting of the elected representatives of the Palestinian population, the comments about 'dirty Arabs' by Israeli Ministers, the 'death to the Arab' chants and of course the institutional racism against Israeli Arabs that results in sentences of 15 months and less for killing an Arab (but life of course for killing a Jew because that is 'terrorism') have led to the call for a General Strike of Israel's Arab population on October 1st. Below is an article by Jonathan Cook explaining the background to the strike call. The increasingly harsh political climate in Israel under Prime Minister Benjamin Netanyahu's right-wing government has prompted the leadership of the country’s 1.3 million Arab citizens to call the first general strike in several years. The Arab leadership said it was responding to a string of what it called “racist” government measures that cast the Arab minority, a fifth of the population, as enemies of the state. Confrontations between the country’s Arab minority and Mr Netanyahu’s coalition, formed in the spring, surfaced almost immediately over a set of controversial legal measures. The proposed bills outlawed the commemoration of the “nakba”, or catastrophe, the word used by Palestinians for their dispossession in 1948; required citizens to swear loyalty to Israel as a Zionist state; and banned political demands for ending Israel’s status as a Jewish state. Following widespread outcries, the bills were either watered down or dropped. He confirmed plans to drop the word “nakba” from Arabic textbooks and announced his intention to launch classes on Jewish heritage and Zionism. He also said he would tie future budgets for schools to their success in persuading pupils to perform military or national service. Mohammed Barakeh, an Arab member of the parliament, denounced the linking of budgets to national service, saying that Mr Saar “must understand that he is the education minister, not the defence minister”. Of the foreign ministry’s 980 employees only 15 are Arab, a pattern reflected across the civil service sector according to Sikkuy, a rights and coexistence organisation. 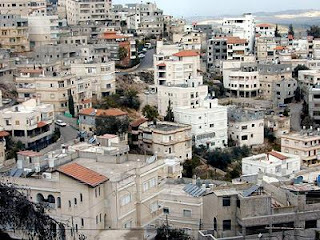 The housing minister, Ariel Atias, has demanded communal segregation between Jewish and Arab citizens and instituted a drive to make the Galilee, where most Arab citizens live, “more Jewish”. Arab legislators have come under repeated verbal attack from members of the government. Last month, the infrastructures minister, Uzi Landau, refused to meet Taleb al Sana, the head of the United Arab List party, on parliamentary business, justifying the decision on the grounds that Arab MPs were “working constantly here and abroad to delegitimise Israel as a Jewish state”. Israel’s annual Democracy Index poll, published last month, showed that 53 per cent of Israeli Jews supported moves to encourage Arab citizens to leave. Some 27 Arab citizens have been killed by the police in unexplained circumstances since the October deaths, Mr Farah said, with only one conviction. Last week, Shahar Mizrahi, an undercover officer, was given a 15-month sentence for shooting Mahmoud Ghanaim in the head from point-blank range. The judge called Mizrahi’s actions “reckless”. Mr Farah said the regard in which Arab citizens were held by the government was illustrated by a comment from the public security minister, Yitzhak Aharonovitch, in June. During an inspection of police officers working undercover as drug addicts, the minister praised one for looking like a “real dirty Arab”. With all the talk of the English Defence League and how they represent a popular movement, it is heartening to hear that they were put to flight in Harrow when they sought to demonstrate against a mosque. It's a pity that racist scum like Tony McNulty, former corrupt Immigration Minister, was allowed to speak. New Labour have been the prime cause of the rise of the BNP and associated fascists. September 11th will now be remembered as the day the people of Harrow prevented the fascists and Nazis, from marching. It is the day that Muslims, Hindus, Jews, Christians, men, women, gays, trade unionists, old and young, all stood together in the street and asserted that “they shall not pass”. Nor did they. In defending the Mosque, we defended all the synagogues, temples and churches from the threat of racist attacks. In preventing the fascists and racists from being able to hold their provocative “static demonstration”, we the people of Harrow stood together in the best traditions of the anti-fascist movement and asserted that “they shall not pass”. Nor did they. Messages of support were received from Ken Livingstone, Navin Shah, and the bishop of Willesden. All reiterated the message that Harrow is, and will remain, a united multi-cultural, multi-racial and multi – religious community. “We, the people, will not allow the racists to run amok in our town to threaten, insult and attack us”. 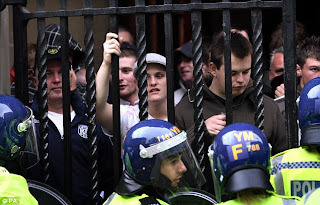 A motley crew of, at most, 20 racists and fascists attempted to march from the Harrow and Wealdstone station end, but hardly had they got in sight of the Mosque but before they were chased off by the youth, only to be taken into protective custody by the police and driven away in a prison van. So embarrassed were the “English Defence League” by the pathetic turnout that they claimed to have called off their “rally” beforehand. Over 2000 anti-fascists held the streets and defended the Mosque. The promise of police protection was not needed nor did it appear. Instead the riot squad were out in their normal provocative manner, with shields and batons ready. From 1.30-8p.m., the streets were peaceful, with unity, chanting and speeches. 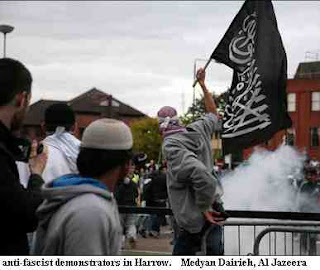 The Brent and Harrow Unite Against Fascism group was formed 6 weeks ago, when we first noticed the threat from the EDL. Since then, we tirelessly leafleted stations, held regular street stalls and contacted as many local groups as possible. Thousands of leaflets and posters were issued, with hundreds of names collected for a petition showing support for the Mosque. A delegation then handed in this petition of support to the Mosque Committee on Friday 11th to show the community is one. In Luton the EDL ran riot, in Birmingham they were sent packing, in Harrow they were chased away with a clear message: NOT WELCOME. In Manchester and elsewhere over the next few weeks, these successes can be repeated by the same mobilisation of thousands. However, we should not be fooled by the size of the sad bunch that turned out on Friday in Harrow. These are the British National Party under a different flag. 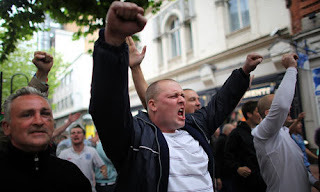 Griffin and his crew know that if they show their real face of thuggery, it might cost them votes, so they come over all respectable, leaving the “English Defence League” to do their dirty work on the streets. Now the BBC plans to allow Nick Griffin to take part in Question Time on TV on the grounds that the BNP is a legitimate political party. We should not allow them to peddle their racist filth and incite attacks on people because of their skin colour or their religion. The BBC should reverse their decision. The Government, police and DPP can if they want, prosecute these groups for incitement to racial hatred. The websites they use to espouse their Nazi messages can be closed down. Instead, we saw the police turn their shields on the anti-fascist youth. So much for community policing! The victory of the anti-fascist, anti-racist movement in Harrow now requires that the Left, trade unionists, socialists and youth groups all come together to pursue an electoral arrangement to ensure that, as a matter of urgency, we defeat the BNP and other fascist organisations. PSC’s Branch Forum met on Saturday in Sheffield. Whereas there is normally a turnout of about 25-30, numbers nearly doubled yesterday as the Executive sought to maximise attendance from their supporters as a result of the recent letter sent by members expressing concern at the influence and effects of the Socialist Action group. The first item on the agenda were the Executive proposals concerning regional representation on PSC Executive. Branches are entitled to form regional structures, which have to be ratified at the PSC AGM, ‘in consultation with’ PSC Executive. The Executive made proposals to make it as bureaucratically difficult as possible, with 2/3 votes at an AGM etc.. This was I understand, although I was late and didn’t hear the discussion, rejected. Instead I entered in the middle of a speech by Betty Hunter. One of the regular features of any national PSC meeting is how the Executive paint a picture of uninterrupted progress and achievement. There is no room for self-criticism or reflection on what went wrong or could have been done better. All discussion about strategy and objectives is confined to the groups who politically control PSC. Thus a motion to next week’s TUC Congress from the FBU, which calls for support for BDS and a ‘review’ of the TUC’s relationship with Israel’s apartheid union, Histadrut, is all the work of the secretive Trade Union Action Committee and the TU officer, Bernard Regan. The motion is, of course extremely welcome, despite the submission of a wrecking amendment by GMBATU, one of PSC’s affiliates. Whether it is passed remains uncertain, given that the TUC has a history of doing deals to neuter and water down resolutions. We know that TUC General Secretary Brendan Barber opposes a Boycott of Israel because at PSC’s fringe meeting at the TUC in Brighton 3 years ago he hotfooted it from the Trade Union Friends of Israel meeting to tell us that he was opposed to Boycott! And when I challenged him and asked what in that case he would recommend to pressurise Israel into ending the Occupation, he continued reading from a prepared script after recovering from the shock of being interrupted. However like the famous photo of Trotsky with Lenin that Stalin had erased, there is no mention of the inconvenient fact that Bernard and the Executive fought tooth and nail against raising the issue of Histadrut at all. After all, as one of their more vitriolic supporters Dianne Langford wrote: ‘At the last AGM, while Gaza was still burning, valuable time was spent debating an unnecessary resolution on the issue of the Histadrut.’ In fact there were 4 resolutions but we’ll pass over that. Histadrut was seen, in other words, as a distraction despite the fact that it had given its full support to the attack on Gaza, has played a key role in effecting a racial division of labour in Israel itself between Jewish and Arab workers, and its role in the trade union movement in this country is as a propaganda arm of the Israeli government. Indeed it was the Irish Congress of Trade Unions that led the way in breaking relations with Histadrut. The Scottish TUC and my own union UNISON, after having had resolutions calling for breaking the links with Histadrut submitted, which followed this up with a call for a ‘review’ of relations with Histadrut. But this is just one example of the Executive’s rewriting of history. Another example was the enormously successful Viva Palestina convoy which broke the siege of Gaza in February. At that time PSC nationally was extremely lukewarm to the idea, as they are to all independent initiatives. Now they are participating enthusiastically and indeed taking charge. Why? Because in that time Socialist Action have entered Respect Renewal, whose leader, George Galloway MP, has been instrumental in the convoy. Formally the letter to PSC Executive from 13 members appeared nowhere on the agenda but in practice it appeared throughout the afternoon. The Executive in the form of Betty Hunter were left without any credible explanation for how it is that the last 3 appointed staff members were all Socialist Action members or close supporters. They also gave the impression of bad faith and worse in causing the resignation of two Executive members. This didn’t of course prevent the virulent and personal abuse of their supporters, in particular EC member Hilary Wise, who declared that it was a lie to say she had been a member of the International Marxist Group. In fact I am quite prepared to apologise for suggesting that she was ever a Marxist or socialist. I just hope that the accusation doesn’t cause any permanent social embarrassment. At one point Hilary seemed so worked up that she was in danger of blowing a fuse. For example I was attacked as a ‘wrecker’, which is the traditional accusation of the right against dissidents. Given that two of the signatories, including myself, were co-founders of PSC, it is a strange piece of wrecking! In 2008, Student Broad Left have had mixed fortunes. During the 2008 NUS Annual Conference, Student Broad Left formed a slate with Student Respect putting forward Ruqayyah Collector, current NUS Black Students Officer, as candidate for NUS National President. Bryony Shanks was put forward as candidate for NUS National Treasurer and the part-time Block of Twelve. Neither Ruqayyah Collector or Bryony Shanks were elected. Other reports include 1 2. There are many more. Bryoni Shanks is now the student officer for PSC. At a time when Student Broad Left is in total crisis, having lost their sole Executive member and alliance with the SWP, PSC has become a place of retreat. But all Betty’s assurances that equal opportunities policies etc. were followed failed to answer how it is that such a tiny organisation, with 100 members at most, has such overrepresentation on PSC Executive and amongst its staff. As I explained, it is extremely easy given the subjective nature of any appointment process for a preferred candidate to be marked higher than the rest. But maybe what was most surprising was that the resignation of the Vice-Chair of PSC Kammal Hawwash and EC member Zoe Mars wasn’t even reported. It was only with the greatest difficulty that either of them were able to address the meeting, something Betty Hunter was clearly unhappy about. Kammal made a very dignified and moving speech, which Betty tried to interrupt at one point, about how he had wanted the PSC Executive response to the letter discussed at the Executive meeting of 5th September before being sent out, since he was unhappy with Betty’s response. He made it clear that he was taking no position on the issues raised but that he didn’t want a response to be rushed out. He was ignored and therefore felt he had no option to resign because, as he stressed, he had been treated with disrespect. The only excuse offered by Betty was that the matter was urgent (why? ), that those who had written the letter had wanted a speedy reply (they hadn’t) and that although the majority of those contacted had not replied there was a majority among those who had replied in favour of it. Yet why this was an emergency that demanded that the EC respond before it could meet to discuss this was never explained. It was the fact that what was being introduced was negative campaigning that was important. The response of Betty Hunter was, well, lacklustre. And more to the point she was not prepared to offer an apology to Kammal for how she had treated him. It was therefore left up to a representative from a branch to move that both Kammal and Zoe be asked to reconsider their resignations, which I hope they do, and in the absence of any apology from the EC a collective apology from the branches was given instead. Terry Gallogy from York asked why it was that none of the 3 vacant positions on the EC had been filled, when that is the normal practice when someone leaves or resigns. Again Betty struggled to give an answer, apart from asking people to understand what it must have been like when the EC got the letter from 13 members. But she didn’t explain why it was such a problem if the contents of the letter were false as she and her supporters maintained? Needless to say this wasn’t an entirely convincing explanation and in the end she admitted that because of their political role in PSC, and the first vacancy, when Sara Colborne left the Chair was well before the letter that was sent on 9th August, the positions were left unfilled rather than allowing what they see as dissidents to fill them. At the end of the meeting, when unfortunately many people were leaving or had left, so few people actually listened, Dianne Langford, who penned the letter referred to in a previous article declared that the real question was one of ‘self determination’ and of course those of us who criticised ‘quislings’ didn’t accept Palestinian self-determination. It is a pity that few people actually listened to this contribution or that there was a debate because in many ways this lies at the heart of many of the issues. Since abandoning class and socialist politics, Socialist Action and their supporters give uncritical support to any one who claims to lead a national liberation movement. So Mahmoud Abbas is also someone we should support, as is the Palestinian Authority. The only problem with this is that the security forces of the PA are trained by General Dayton of the US army in Jordan under Mohammed Dahlan and they are not being trained in order that they can evict Israel from the West Bank! Their sole purpose is internal repression and silencing any opposition to Israel’s occupation as Vanity Fair’s article ‘Abbas, Dahlan conspired with Israel, US, to topple Hamas’ in March 2008 details. If anyone has any better adjective than quisling then I’d be grateful to know what it is! What type of organisation should PSC be? But the example above demonstrates above all that the real question at the heart of the present disagreement is not the antics of Socialist Action but what are the political consequences of this. What kind of organisation is PSC going to be? One of the problems is that there is very little debate within PSC on these issues. Debate is seen as divisive and a threat by the Executive. Activism is essential but in itself it is not enough. PSC has to have some sense of direction. The position of the Palestinians is extremely weak. They are themselves divided into the West Bank and Gaza and between those living under occupation, in Israel and the diaspora. The Arab regimes make no pretence of supporting the Palestinians and Israel, as a consequence of the disastrous Oslo Accords which the present Executive still effectively supports has been to strengthen Israel enormously at the expense of the Palestinians. Debates about 1 v 2 States have bypassed PSC almost entirely. The obvious question that arises is if we support a two state solution then that must include Israel as it is presently constituted, i.e. a racist Jewish state. So when I raised the issue of a General Strike that has been called by Israeli Arabs for October 1st because of the horrendous attacks on them, this went down like a lead balloon with EC members. Certainly very few present were even aware of what is happening and the Executive hasn’t used the members’ bulletin to inform people. But this is quite unique in the history of those Arabs who were not expelled from Israel in 1947-8 or subsequently. Likewise there has been little done in the wake of Lieberman’s election as Foreign Minister. Yet this throws up an important question. If a Palestinian statelet were created in the pockets of the West Bank that are not at present populated by settlers, then it is clear that this is going to create a possibly unstoppable move within Israel to ‘encourage’ its Arab citizens to move into it. There is a growing consensus on this issue in Israel yet at the moment it is the elephant in the room for PSC. Nor is there great clarity about whether we are calling on people to boycott simply settlement produce or any Israeli product. Communication in PSC is vertical, from the Executive down, and not between branches and members. Hence why PSC Executive is reluctant to implement the clauses in the Constitution providing for regional representation. The Branch Forum itself displayed many of these features. Some people saw the letter as being a diversion from the work of Palestine solidarity and yet at the same time were unhappy, to put it mildly, by some of the issues that were raised and the secretive and manipulative way that the Executive was dealing with them, not least in hiding behind the very staff members that they had put into position by stating that raising the issue was somehow an attack on the staff individually, which it is not. One of the strongest arguments from an Oxford member was that this would play into the hands of the Zionists. This is a powerful argument but in fact it isn’t true. An effective solidarity movement, which for example raised the attempts to criminalise support for the Palestinians as anti-Semitic would be a far greater threat to them. There has been a widespread debate over the EU Monitoring Committees definition of what constitutes ‘anti-Semitism’ which effectively puts an equal sign between anti-Zionist and anti-Semitism. This has enormous implications as we are seeing with the arrest for racially aggravated trespass of 5 members of Scottish PSC. This too was not on the agenda or mentioned. It is ‘too difficult’ for EC members to deal with. Instead it is left to Scottish PSC and Jewish anti-Zionists to deal with even though it can and does lead to supporters of the Palestinians being attacked by the Police as happened on the Brighton demonstration against the Lebanon invasion 3 years ago. In fact this is really a form of blackmail, which Betty Hunter engaged in quite openly by stating that the notoriously racist and anti-Islamic site, Harry’s Place, had already covered the issue of the letter to PSC Executive. I won’t link to it but it has. Having looked at it is clear that the main gist of their article was a personal attack on me! But since when does PSC decide what it can and can’t discuss on the basis of Harry’s Place? A PSC which engages in routine demonstrations and marches and the lobbying of Parliament so loved by the EC is far less of a threat because what it is doing is going through the motions. The Histadrut affair demonstrated that the Executive is afraid to raise issues with the unions which might jeopardise their affiliations, yet a failure to do so renders an affiliation meaningless. In any case, the Zionists have never been reluctant to engage in open public disputes when they felt it warranted. They have never suffered any political damage as a result, on the contrary a democratic PSC is a strength not a weakness. When the British JNF and the Israeli JNF were locked in a long legal battle at the High Court over who owned which stolen land it did them no harm. And likewise with PSC. The questions which we asked PSC Executive remain unanswered because they are incapable of answering them truthfully. By admitting that one small and extremely secretive political faction has obtained a stranglehold over PSC administratively and politically then it would raise other issues such as how this has been allowed to happen. It might explain why having a parliamentary officer is more important than a Branch Development Worker which I proposed. One of the ideas that Betty Hunter put forward re students was a new web site. Now no one is opposed to web sites but the student occupations in January weren’t the result of web sites (though they produced some excellent ones) but of a feeling of anger, not least that NUS Executive had toed the Zionist line. We need a Student Officer to match the full-timers that the Union of Jewish Students has at its disposal. The result of no PSC work in the student movement was that PSC was almost completely absent from what happened when colleges when into occupation. And it doesn’t even attempt to intervene effectively at NUS nationally or indeed to have a programme of freshers’ stalls and actively creating new Palestine societies in colleges which don’t have them. And that is why the campaign to democratise PSC will continue. I made a few suggestions for the electoral regulations: No slates. People stand on their own records. That people declare what political party or organisation they are members of in order that people can make an informed choice. And in regard to the fact that some attendees at PSC Conference, who may not be individual members, can vote 3 times because they are union representatives. I suggested one person, one vote. If a union can’t send 3 people to PSC’s AGM then there must be something wrong. Naturally these went down with the EC members present and their supporters like a lead balloon. They were ‘impracticable’. Maybe. One can’t force someone to declare their allegiances but there will be a strong moral compulsion on them to be honest. And also that it is not up to the EC to decide who and if to replace if there is an EC vacancy. It should be, as a matter of course, the runner-up. The EC’s intention at the Branch Forum was to close down the debate over what has been happening. Its effect has been the opposite.